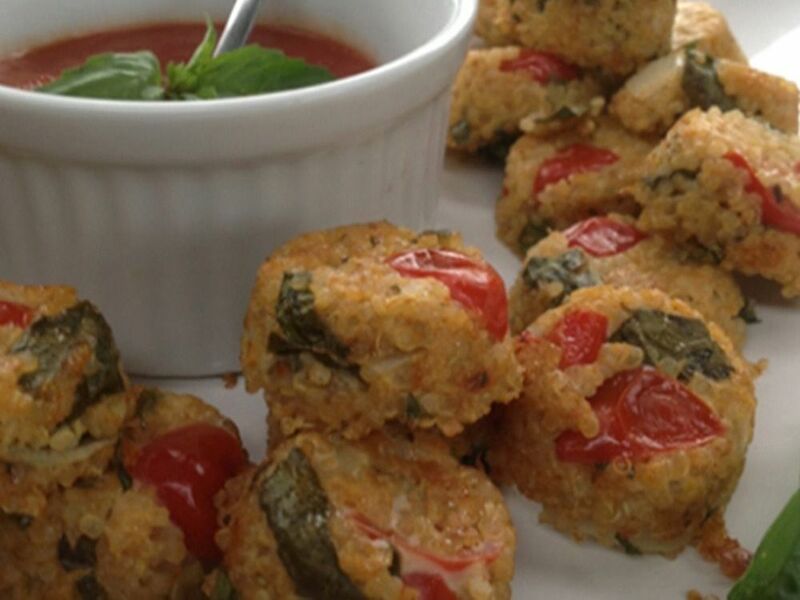 I made these amazing Quinoa Pizza Bites for a family BBQ. All of the 150 bites that I brought were devoured with no time to spare. Everyone from kids to vegetarians to meat eaters absolutely loved them. The tribe filled up on them, that we had so much leftover food and had to have another BBQ the following weekend. They are really quick and simple to make and sure to be hit with the whole family. Cook the quinoa by with the absorption method (1 part quinoa to 2 parts water OR free boil in a generous amount of boiling water until tender). Strain and set aside in a large mixing bowl to cool. Grate the mozzarella into the bowl of quinoa, add cherry tomatoes that have been halved and the basil leaves that have been roughly chopped. Then add in the Italian Classic Herb blend and the salt and gently stir until mixed through. Crack the eggs into a cup and roughly whisk to combine. Then add the whisked eggs to the quinoa mix and combine well. Grease a muffin tin very well with the olive oil. You do not want these to stick. Put spoonfuls into the tin so that they are about 1 cm thick. For bite size use a mini muffin tin or for snack size use a standard muffin tin. Bake at 200°C for 20 minutes or until brown and crisp. Allow to cool in the pan before removing.